Robin and Marianne have started a new life running a bar – but Little John wants to recruit Robin back to thievery. He refuses – except he’s behind on his taxes and the Sheriff of Nottingham is now looking to collect or take everything and throw Robin in debtor’s prison (I do like that Marianna refuses to let Robin speak in her defence or on her behalf – she can speak up herself thank you very much). Who do the desperate turn to in their hour of need? Good ol’ Rumplestiltskin shows up with an offer Robin can’t refuse: steal an Elixir of the Wounded Heart from a king for him (Personally, I think Rumple could do his own thieving.) This involves going to Oz. Helpful smoke allows him to steal from Zelina (and a nifty always-hits-bow) without her turning him into a winged simian. But he tells Will he failed to get the Elixir – Will wanted some because of his epic heartache over Anastasia. Poor Will. How can you say no to those so-sad eyes? I take it back, child kidnapping isn’t the worst crime, saying no to Will Scarlet’s puppy-face is clearly the worst sin. Will does end up with at least some of the potion – Robin gave it to him. This does teach Robin about stealing from the rick and giving to the poor – which is how he becomes Robin Hood. Including his plan on evading Rumple (since he broke his deal) with the “Sixth Leaf Clover of Oz” which he stole while in Oz and allows you to become anyone. The Elixir of the Wounded Heart is just what Gold needs now. 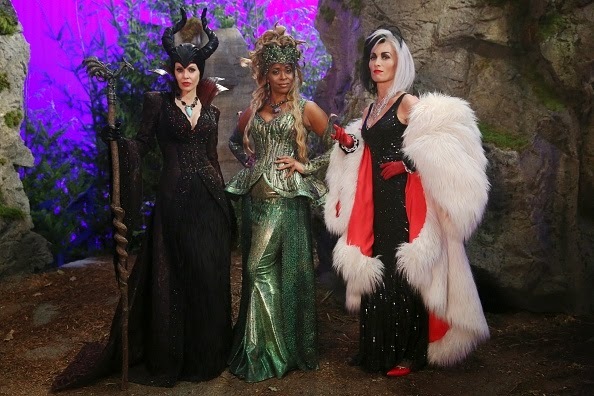 Happily there may be some in New York – since the Wizard of Oz is set up there (under the business name “wizard of Oak”) under the instruction of Zelina to keep an eye on Emma while she was there. He’s decided to hang round and Gold bets he’ll have woo-woo. Robin breaks in – and the greatest thief doesn’t really know anything about modern alarm systems. Though he manages to escape with the potion. Marianne isn’t exactly happy with him though, risking his freedom for the sake of Gold (and a nebulous code of honour that means you have to commit crimes in the name of your enemies). Marianne agrees with me and thinks the greater good would be to let Gold die – Robin is not impressed by this shift from honour and morality to common sense and not being a bloody fool. Robin gives Gold the elixir in exchange for him not contesting their ownership of Baelfire’s flat. Robin leaves but Gold is horrified to find the elixir didn’t work. Why? Because Marianne switched it to make sure Gold dies, as she explains in a villainous gloat over his death bed; except it’s actually Zelena in disguise, using the Sixth Leaf Clover of Oz, not Marianne. This also means Zelena didn’t actually die when Gold stabbed her. Her essence followed Emma through the time portal and ended up with them in the Enchanted forest in the past. There she killed Marianne and took her place. All to ruin Regina’s happiness. She then mocks’ Gold on his sick bed and has a look of utter glee when it seems to turn into a death bed. He doesn’t die – modern technology is awesome like that. This lets Zelena exposition her plan a little more; she wanted to steal Regina’s true love but it didn’t work, which she (not very subtly) puts down to the while good-guys-always-win thing. And to undo that, she needs the Author. Which means she’s making a deal with Gold, in exchange for the Elixir of Heart-Breaking he doesn’t seek her death and he works her Happy Ending into his plans for the Author. He accepts it – and Robin is waiting for Gold to hand over Neal’s things because he’s almost sickeningly decent. Gold doesn’t want it because relics of Neal/Baelfire in New York are just a reminder of how he failed his son and that failure caused Balefire to grow up there alone. Robin decides to also talk about how Marianne is a stranger to him now – and Gold gently pokes Robin towards Regina and true happiness. To add to the angst, Marianne/Zelena finds Regina’s number on Robin’s phone. She pushes Robin to make a choice – and she chooses Marianne in the name of when she once gave up everything to be with him as bandit in the forest. He deletes Regina’s number. Ok I am glad that Regina’s Happy ending is now much more open. And I’m really glad to see that Zelena is back because she was a pretty awesome villain. But retroactively killing Marianne – one of the very very few WOC on this show? No, this is not the way I wanted any of this to happen. Noooo don’t do this. Of all the ways of doing these things, why do this? WHYYY? There are so few POC on this show, to just not only kill someone but to backdate it to make the whole character completely non-existent – to retroactivity remove her. It also removes so much of the complexity of this storyline. The whole drama was that Marianne wasn’t evil and who Robin still feels affection for. It’s complicated BECAUSE there are no villains, because there are only innocent victims here. Because this is the kind of mature conflict that adult relationships can actually face without the simplistic fairy-tale good/evil binary.